If you’re into classic video games (Megadrive, Mastersystem, or Super Nintendo era), you’ll probably love Roasty McFry and the Flame Busters by Thunderkick. It’s a slot that follows the adventures of a crew of fire fighters tackling a savage inferno downtown in some highly pixelated city. The twist is that all the imagery and sound effects sound like they’ve come right off your favourite 8 or 16-bit console! In terms of game specifics, Roasty McFry and the Flame Busters is played across a standard five row, three reel gameboard. It features the always popular 243 ways to pay system in the place of win lines and packs in the special features too. Let’s look closer at this blast from the past! Great 16-bit style graphics, soundtrack, and animations. 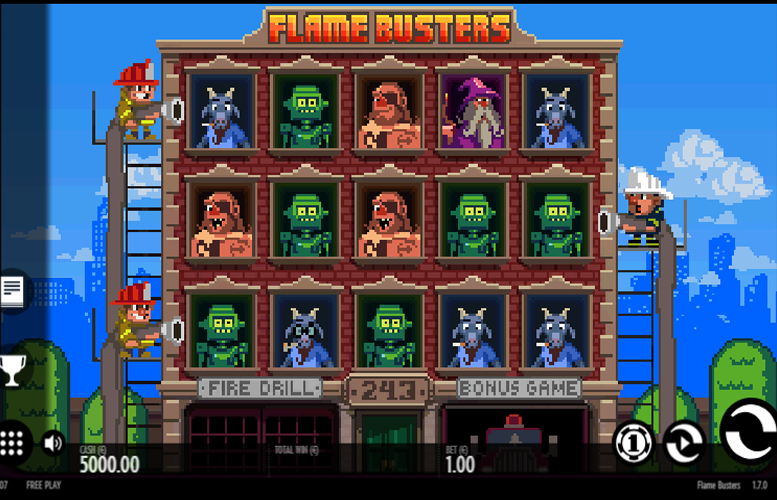 Players of a certain age will certainly feel a sense of nostalgia playing Roasty McFry and the Flame Busters. Innovative and diverse game features. Bonus stages aren’t usually Thunderkick’s strong point but those found on this title are great. Fantastic touch to include the 1986 trade mark and “Press Start” to initiate the game itself. Very low main game prizes. If you were hoping to spin in a lifechanging amount of money by just matching five-of-a-kind, you will be disappointed by this title. .
Fireman rescuing cat = 10x the total bet. 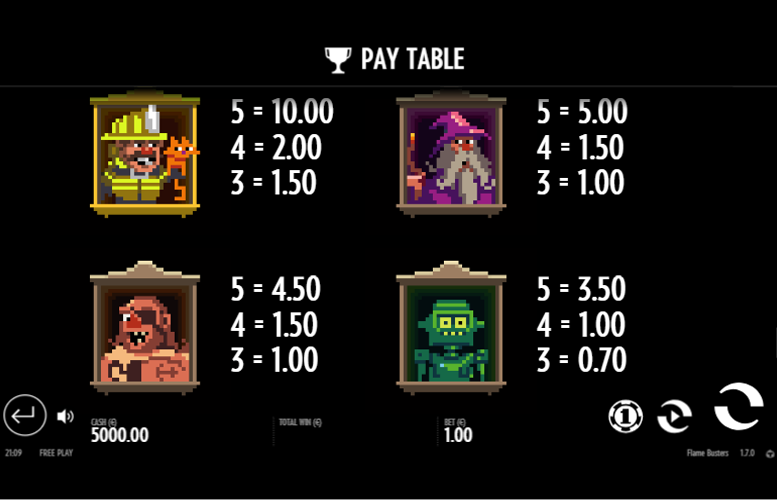 Wizard = 5x the total bet. Man with eyepatch = 4.5x the total bet. Robot = 3.5x the total bet. Smoking goat = 3x the total bet. Rather than making payments using specific win lines, the Roasty McFry and the Flame Busters slot machine uses the ever-popular 243 ways to pay model instead. Instead of matching symbols down lines, players will receive payment when three of more matching symbols land in any position on consecutive reels. The Fire symbol is a mystery symbol that will be replaced by another symbol type, except for “wilds” and “scatters”. Landing three or more “scatter” symbols anywhere on the reels will trigger the Bonus Game. 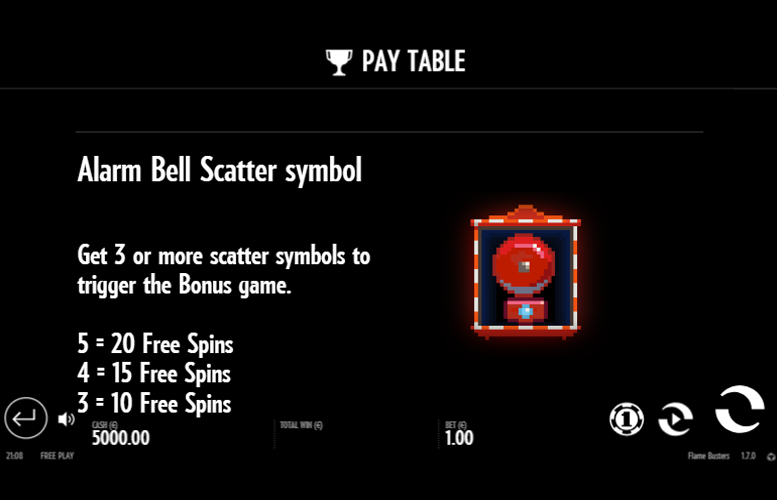 Three, four, and five fire alarm “scatter” symbols will trigger 10, 15, and 20 Free Spins respectively. 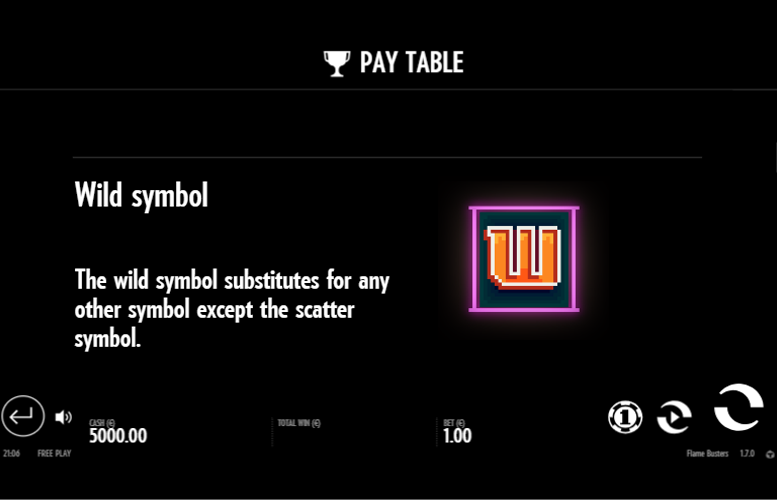 During the Bonus Game, players can collect additional “scatter” symbols. This will make them advance upwards on the Bonus Game building. 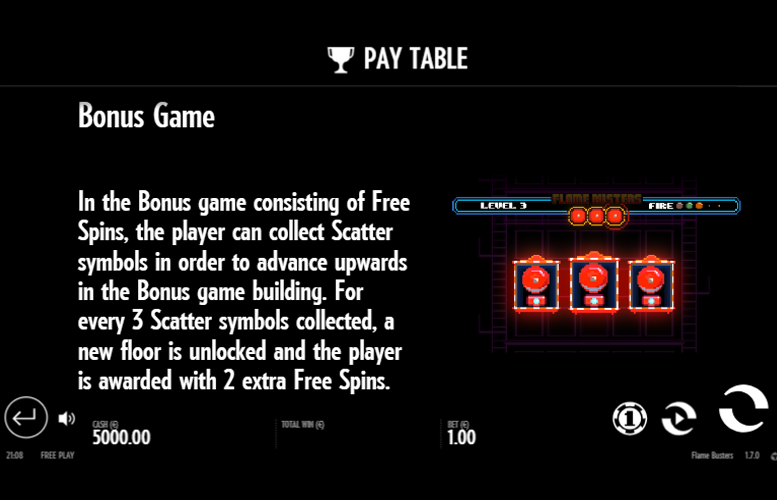 For every three “scatter” symbols collected, a new floor is unlocked, and the player will receive an extra two free spins. 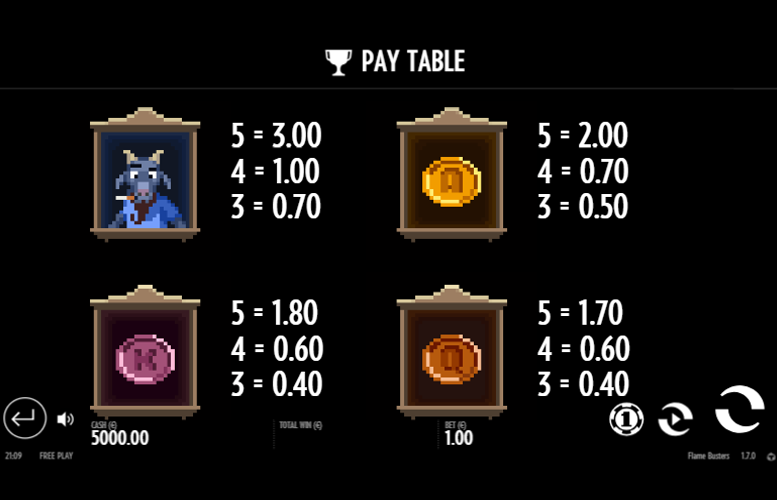 For every floor unlocked, the lowest valued coin will turn into the Fire Symbol for the remainder of the Bonus Game. Players should note, however, that coins that have been turned into Fire Symbols cannot be a Fire symbol replacement. This feature may be triggered randomly during the base game. It transforms between one and give low win symbols into the Fire Symbol. King = 1.8x the total bet. Queen = 1.7x the total bet. Jack = 1.6x the total bet. Ten = 1.5x the total bet. The Roasty McFry and the Flame Busters slot machine doesn’t offer players a great deal of discretion over how they spread their bets around. On many titles these days, it’s possible to adjust the number of win lines played per spin, as well as the number of coins bet on each one. This isn’t the case here and players must choose between a set of different total bet amounts. The lowest is just 10p and the highest is £100. This should be more than enough for all but the highest rollers around though! We’re probably a little biased about this title being as we’re massive old-school video game fans but Roasty McFry and the Flame Busters is a quality offering from Thunderkick. It successfully replicates the look, sound, and feel of a legendary 16-bit game on some long-forgotten console. However, it also packs in some great special features too, creating a well-rounded and enjoyable package. If you’re a fan of either quality slot machines with innovative features or classic video gaming, you will likely love this game. We know we do! This game has a rating of 4 / 5 with 573 total reviews by the users.